I got my camera back last weekend and can finally show you all of the details from the baby shower I helped throw for my sister-in-law (and soon-to-be nephew) two weeks ago! I have so much to share that I’m going to break it up into a few posts. First, let’s talk about what I made for the little man. 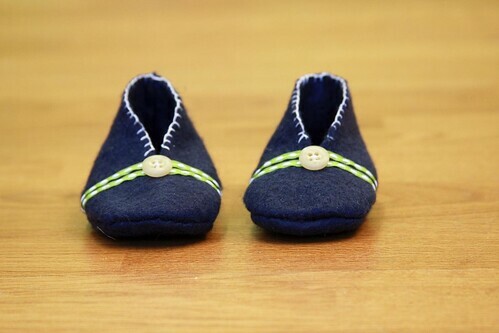 I made these little booties and once I figured out all by myself how to asked my mom how to gather the soles, they were really easy and fun to sew. I machine-stitched a little rectangle of the same felt to a onesie & added some buttons. So cute! I also made him a minky baby blanket. This cute and innocent looking blanket became the bane of my existence the week before the shower. What started as (or so I thought) an easy two or three hour project quickly became a 20 or 30 hour project. Granted, I know nothing about quilting so that slowed me down quite a bit, but 1.) minky fabric stretches and therefore moves all over the place even when you pin it, and 2.) whoever invented quilt binding and the ladder stitch was either really evil or just had too much free time on their hands. Longest run-on sentence ever/rant over. (Sorry Jordan) Regardless of my inability to follow simple instructions, the blanket turned out really well and, dare I say, I would totally make another one. I cross-stitched this cute little label with my terrible free-hand lettering and added it to one of the corners. It’s hard to believe that it was almost exactly a year ago that I was helping throw my very first baby shower for my dear friend Jordan and her little cutie Chase. Now I’ll have another adorable little baby boy in my life. All the love and squishy cheeks with none of the diaper changes and sleepless nights. Next up: the decorations, the food, and of course, the party! It’s HALLOWeek! I absolutely adore fall, especially Halloween. This is the most beautiful time of the year to live in Fayetteville. All of the trees are orange and red and the weather (minus the rain the past two days) is perfect. Can you guess which one I will probably put off working on until the last possible moment?